Bruce Willis often portrays a gun-wielding action hero on the screen and now it seems that association with guns translates to real life. In a recent interview promoting his upcoming movie "A Good Day to Die Hard," Willis said he's against the new gun control laws proposed by President Obama because he believes they could infringe on our Second Amendment rights. "I think that you can't start to pick apart anything out of the Bill of Rights without thinking that it's all going to become undone," Willis told The Associated Press. "If you take one out or change one law, then why wouldn't they take all your rights away from you?" Willis, whose films have grossed over $2 billion in North America, will reprise his most famous role as John McClane in the fifth installment of the Die Hard series hitting theaters February 14. 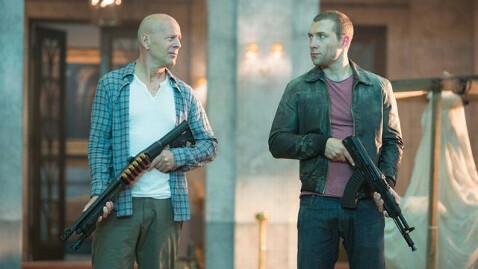 Guns are synonymous with McClane, who will no doubt be firing away at the bad guys in his fiction film. But, Willis says he doesn't believe there's a link between Hollywood entertainment and high-profile mass shootings like those last year in Connecticut and Colorado. In wake of the Sandy Hook Elementary School shooting, the executive vice president of the NRA blamed gun violence on Hollywood. Those on the other side of the issue have also targeted violent movies and video games as a possible inspiration for violence. But Willis, who expressed sadness for the tragedy in Newtown, said he's not sure how you legislate against insane acts. "It's a difficult thing and I really feel bad for those families," he said. A group of celebrities including Tony Bennett, Chris Rock and Amanda Peet spoke out in favor of the President's proposals at an event in Washington DC on Wednesday.